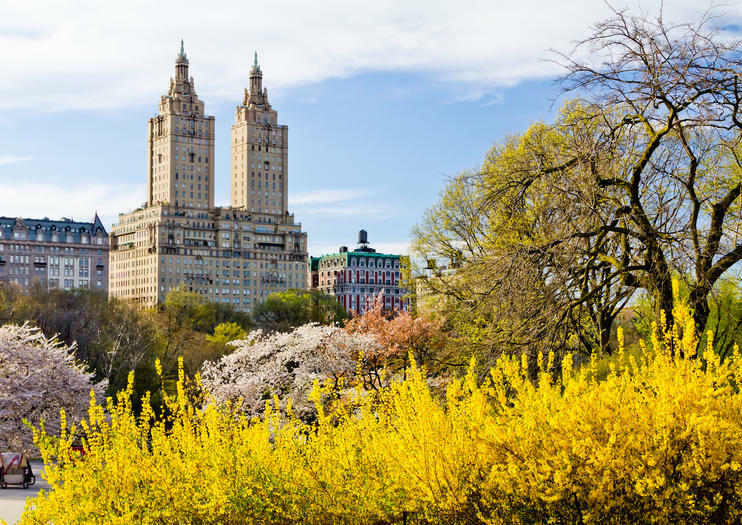 Spring in New York City is the ideal time to get out and about and explore, with colorful flowers blooming across city parks and gardens and warmer temperatures promising plenty of fresh-air fun. If you’re planning a trip to NYC this spring, here are a few must-dos. Hop on the saddle for a bike tour of Central Park. View blossoming spring blooms at the New York Botanical Garden. See the Manhattan skyline on a sightseeing cruise. Visit the open-air observation deck of the Empire State Building. Check off highlights such as the National September 11 Memorial, the American Museum of Natural History, and One World Trade Center with a multi-attraction sightseeing pass. Treat your taste buds to a gourmet food tour. View must-see attractions from the top deck of a hop-on hop-off tour bus. Ride the ferry to two legendary landmarks: Liberty and Ellis islands. Embark on a day trip to Washington DC or an overnight tour to Niagara Falls. See three iconic sites on this Viator Exclusive tour in New York City, available nowhere else. With a guide by your side, explore Wall Street and learn about the history of its financial institutions. Then walk over to the 9/11 Memorial to pay homage to the lives lost there in 2001. Finally, get access to the reserve line for the ferry to Liberty Island where you'll enjoy an audio tour of the Statue of Liberty and adjoining museum. This Viator Exclusive tour of Wall Street, the 9/11 Memorial and the Statue of Liberty is a great way to experience three not-to-miss sites in one day. Explore the beautiful sights of New York City’s Central Park on this leisurely bike tour. Follow your local guide along the park’s scenic and bike-friendly paths as you cruise by famous attractions like Strawberry Fields, Belvedere Castle, Cleopatra’s Needle, and the Bethesda Fountain. Learn about the history of this green oasis in the center of Manhattan on an easy, 2-hour ride. Choose from a morning or afternoon tour to suit your sightseeing schedule.